This trail provides a diverse experience beginning in an urban setting and eventually leads into Red Rock Secret Mountain Wilderness, increasing the potential for solitude. The first half of this trail is often busy and there is jeep tour traffic nearby. Enter at the signed trailhead which is open only from 8 a.m. to 6 p.m. The trail dips to cross a wash then climbs out to the Devils Kitchen sinkhole just off the trail to the right at 1/4 miles. The trail then goes over level ground for 1/4 mile to the "Seven Sacred Pools" to the left of the trail. It continues on in the partial shade of Arizona cypress and intersects the end of a jeep road at 1.2 miles. The trail forks at the wilderness area boundary sign 1/8 mile further on. The right branch leads up rather steeply for 1/4 mile to cave like arches. Great views. The left branch is the main trail. This leads out of the wash on a moderate grade. Most of the shade is lost, but the views open up. The trail becomes increasingly steep and rocky as it climbs to the pass. Nearing 2 miles, it levels out on top of Brins Mesa, then continues for another 1/4 miles where it intersects Brins Mesa trail. 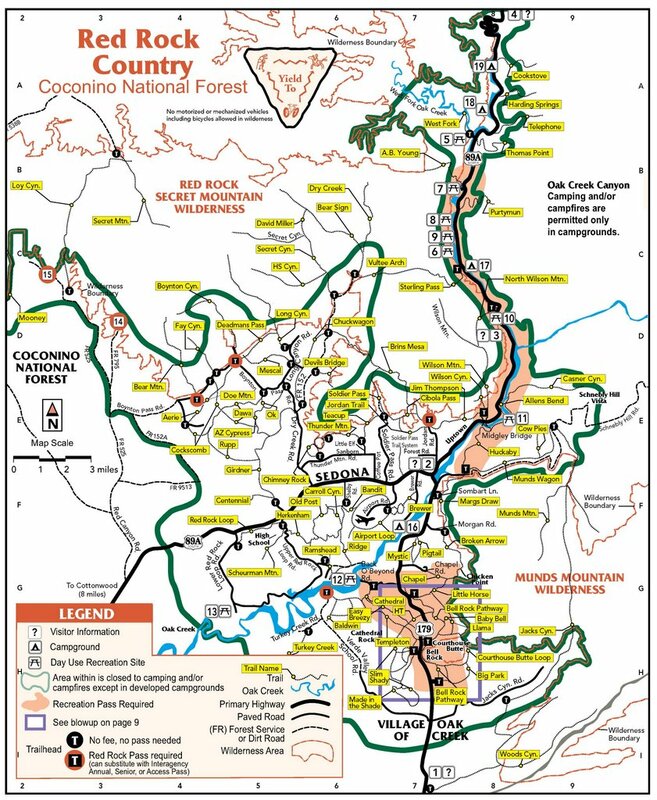 Ultimately, scenic vistas can be enjoyed south into Sedona and north into the wilderness and the red cliffs of the Mogollon Rim. Return by the same route for a 4 mile round trip hike. The description below was written before much of anything official existed. Nestled between Brin's Mesa and Capitol Butte Soldier Pass is tourist central. Jeep tours, about a million a day comb the area. Okay maybe less, but I guarantee you will see a few. This is also a very popular mountain bike trail. So needless to say you will be sharing the trail. Two reasons this trail gets high use is the location and the perks. The trailhead is literally in a neighborhood. From the trailhead check out all the signage information. Start hiking and before you know it the first perk opens up out of nowhere. A hundred foot wide and fifty foot deep sinkhole opens up. Formed in the 1880's this sinkhole is amazing due to the shear vertical rock walls. A tall pine tree sits at the bottom giving away its age. Be careful here. Continue hiking, soon you will encounter several natural inline pools cascading down a drainage. These pools would be an awesome site with running water. I have yet to witness such. Continue the hike and enjoy the area. Near the mile and a quarter mark the jeep road ends at the wilderness boundary. The trail continues through a shallow winding ravine. When you reach a fork take the right option to head on up to the arches. At the same fork a left will take you up to Brin's Mesa. You have great views and the option of extending the hike. 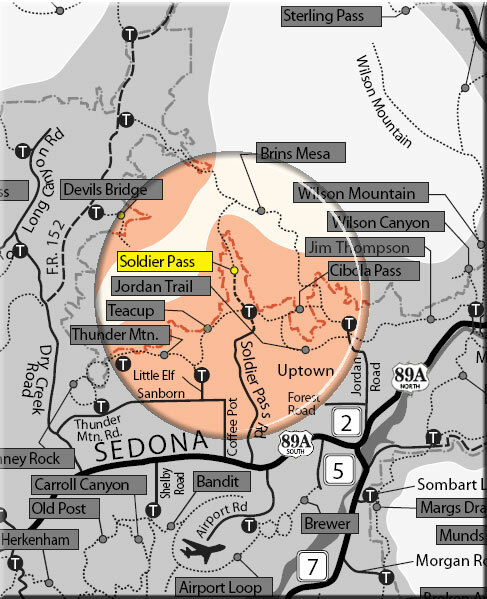 From the 'Y' in Sedona ( 179/89A ) follow 89A 1.2 miles Southwest to Soldier Pass Road. Turn right and follow 1.4 miles to Rim Shadow Drive. Turn right again and look for the parking area on the left with in a .25 miles.